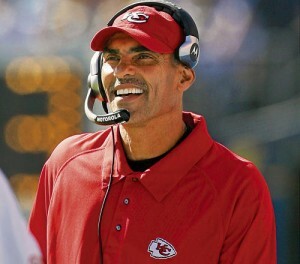 Herm Edwards will be speaking at both Texas A&M Kingsville and Monterey High School. The Texas A&M Kingsville event will be February 24th at 7 pm. It will involve Edwards giving a motivational speech called “Your Life Plan.” Edwards will return to Monterey High School, his alma mater, this coming Monday. Edwards will be presenting Monterey a golden football to represent Super Bowl 50. The NFL has asked former players and coaches that have participated in previous Super Bowls to present the golden football to their high schools. The Monterey High School appearance is definitely a fun experience for both Edwards and the school. Edwards has made many comments regarding his visit to his former high school such as his remembrance of wearing those green uniforms that Monterey High sports. Edwards has a certainly busy schedule this week leading to the Super Bowl with up to 50 radio shows, including Mike and Mike and Sportscenter. All of this and making these appearances at both schools should prove to be a long rewarding week for Edwards as well as everyone he gets to spread his love of the game too. Herman “Herm” Edwards is a Fort Monmouth, New Jersey native and spent his high school playing days for Monterey High School in New Jersey. Edwards went on to play college football for both the University of California and San Diego State in his senior season. Edwards went on to play professional football with the Philadelphia Eagles from 1977 to 1986 in which he played in Super Bowl XV. Along with having 33 interceptions as an Eagle, Edwards never missed a game while a member of the Eagles. Edwards’ most memorable moment as an Eagle came at expense of the New York Giants, more commonly known as the miracle at the meadowlands, where Edwards returned a fumbled handoff in the final seconds to win the game for the Eagles. This was the play that helped create the victory formation teams’ use today. After his playing days, Edwards took his love of the game to coaching. Edwards’ head coaching career in the NFL began with the New York Jets which included a 39-41 record and three playoff berths during his tenure with the Jets which ended in 2005. Also during his time with the Jets, Edwards stated one of his most famous “Hermisms,” “You play, to win the game!” The Jets made an unconventional move after the 2005 season when they traded Edwards to the Kansas City Chiefs for a player to be named. Edwards coached the Chiefs for three seasons during which time the Chiefs entrusted Edwards to rebuild the franchise. Edwards retired after the 2008 season, one that was marred by multiple injuries to key players. Edwards has since been a key cog at ESPN, in which he is an analyst for the network. Herm Edwards will be making speeches at both Texas A&M Kingsville on February 24th at 7 pm and his alma mater Monterey High School this coming Monday. Both of these events will allow Edwards to give one of his highly thought of motivational speeches and talk to the attendees about life and reaching their goals. These events look to have great turnouts and will be a great opportunity for everyone to learn about life from a very successful football personality. If your company is interested in finding out availability and booking fees for a former professional football player and coach like Herm Edwards or other sports celebrities for a Keynote Speech, Fundraiser Event, Guest Appearance, or Football Camp, call us at 1-888-246-7141.